In my articles I have to make a tradeoff between making things approachable and including all the little details you might need in a real project. I tend to err on the side of making things approachable, but that means people can get frustrated when trying to translate these topics into real code. I dropped the template parameter for SimpleGraph because it's only ever used with char. Even though Location is a property of the Graph, the templated code for this is verbose and distracting so I made Location a separate template parameter. I switched from unordered_set and unordered_map to set and map; in practice you might prefer a hash table or an array, depending on the location type, but it's hard to pick one of these that's best for all cases. I dropped some of the reference and const parameters. I switched from set.count() to set.find() to test membership. I wrote out explicit types instead of using auto. I used std::xyz instead of using to omit the std:: namespace. I have mixed feelings about most of these, and went back and forth a few times before deciding I'm overthinking it and just going with my gut. The code isn't as fast but I hope it's a little easier to read. I added a section at the end with the faster code. My goal is to show how the algorithms work, and not to write reusable library code. That's not what I'm good at. Whenever I try to show code, I get into these messes. I hope the code I have is a reasonable starting point for anyone who's writing their own instead of using a library. This year I'm trying to iterate more and publish things more often. Take a look at the updated A* implementation page and let me know what you think. I'll add suggestions to the Trello page. Back in 2010 when I wrote a procedural map generator based on Voronoi polygons instead of Perlin noise, the goal was to produce volcanic islands with a variety of monsters. I had started with Perlin-based height maps but got too much variety in the maps. 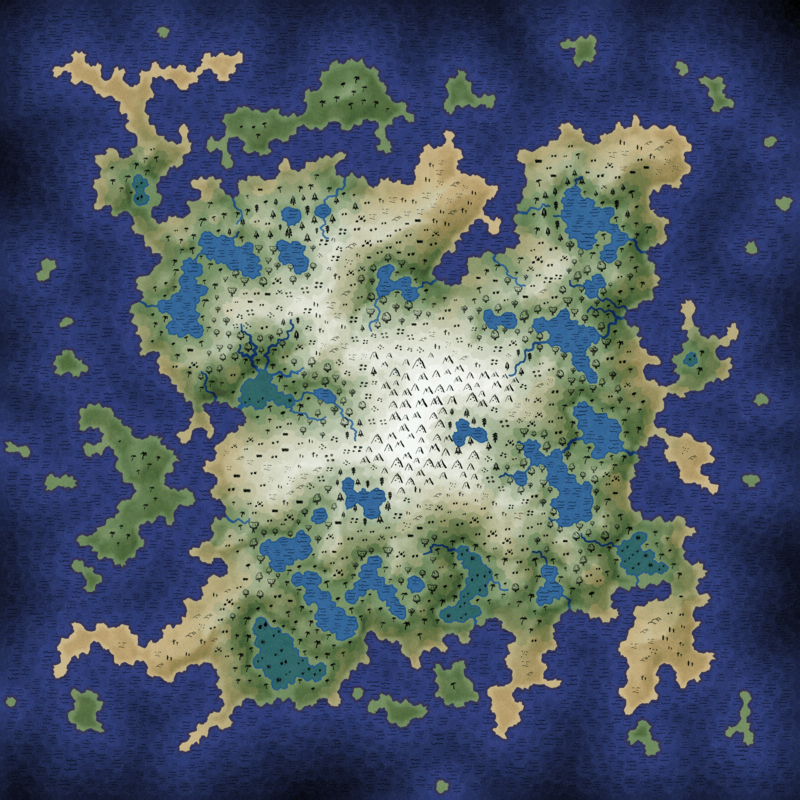 I decided to use Perlin noise for deciding land vs water, but use other algorithms for everything else. I wanted the players to start on the beach and walk uphill, meeting other players who started elsewhere on the beach and were also walking uphill. I wanted to always produce islands with mountains in the center, so that the players on any beach would travel the same distance to get to the top. The maps were intentionally unrealistic but they were designed to satisfy the game design constraints. I made a Flash demo to accompany the article. I'm looking again at traffic to my site and how I write. A few years ago I realized I had a "ratchet" problem. My first articles were less polished, and I felt good publishing them. When I got better at writing, my newer articles were more polished, but I would hesitate to publish. I didn't want to publish until I got everything just right. And as a result I've been publishing less and less the last few years. The spikes feel good. HEY I got on reddit! But they don't seem that important in the grand scheme of things. Most of my visitors come from day to day visits, not from the spikes. And that means my trying to make sure everything's polished before I put it up may be unnecessary. A friend of mine says I should treat my pages like wikipedia. The cumulative traffic graph supports that. A few years ago I gave myself an “out” by having "x" pages that were less polished. They were blog entries. They were “fire and forget” pages that I would publish, unpolished, and not update. It worked. I published a lot more. I really liked publishing every few weeks instead of every few months. The trouble was that it was too easy of an out. I ended up publishing almost everything as "x" pages the last two years, and I think it took away from my regular pages. In particular, the "x" pages let me get away with not iterating. I didn't update them after I posted. And they didn't get better. And then they got very little traffic. If my pages are like wikipedia I should be putting up incomplete unpolished pages earlier and then refining them over time. So this year I want to publish more often but more importantly iterate more after I publish. I can treat the early viewers as beta testers. It's the “launch early” philosophy from startup culture (minimum viable product, etc.). I tell other people to do this but I haven't been practicing what I preached. Take a look at my Trello page to see the kinds of things I want to work on.